Common wisdom holds that hiring physicians is likely to cripple a hospital's budget, but some health systems are pushing back against that notion, arguing that their finances were unchanged or, in some cases, improved after bringing on new docs. Among the respondents to Modern Healthcare's annual Hospital Systems Survey who hired more physicians in 2017, 76% said the move didn't materially change their financial performance. Another 22% even said their finances improved after hiring more doctors, and just under 3% said their finances worsened. Among the 47 health systems that participated in the survey, there is a decidedly more positive outlook than some industry experts expected. The Medical Group Management Association last year estimated that hospitals' multispecialty physician groups lose nearly $185,000 per physician annually, and other industry groups have released similar estimates. The basic idea is that physician compensation and other expenses related to their practices exceed the amounts they bill for. But there's a big caveat to numbers like that: They don't provide a total picture of the revenue doctors generate for the health systems during their visits with patients, because they typically don't include ancillary services such as imaging and stress tests. “It's not as bleak as it seems,” said Ken Hertz, a principal consultant with the MGMA's healthcare consulting group. That's true for Vidant Health, an eight-hospital system based in Greenville, N.C. When Vidant compares its physicians' salaries with the revenue from the services they bill directly for, it looks like they operate at a deficit, said Craig Hepp, Vidant's senior administrator for population health. “But that isn't the way it ends up being when you look at the other work they bring into the health system, whether it's labs or imaging,” he said. The same physician practice can look like it's performing very well or very poorly depending on how a health system does its accounting. Typically, it's the surgeries and imaging that generate margins, not the physician practices themselves, Hepp said. Vidant is awaiting regulatory approval on a merger between its medical group and East Carolina University Physicians, a deal that Hepp said would almost double the health system's employed physicians. Erlanger Health System, a three-hospital system centered on an academic medical center based in Chattanooga, Tenn., employed 34 more physicians at the end of 2017 compared with the previous year, according to its survey answers, and plans to hire more this year. Joe Winick, Erlanger's lead executive responsible for planning, business development and analytics, said the system's finances improved as a result of hiring more physicians because most of the new doctors add revenue through increased referrals, especially if they're local and bring an existing patient base with them. “In the collective sense, the addition of physicians did improve our finances,” Winick said. Erlanger has been hiring “pretty much as fast as we can” to keep up with demand in its markets, he said. Doctors are increasingly abandoning ownership stakes in their practices in favor of becoming employees. The American Medical Association last year released data showing 47% of doctors were employees in 2016, up from 42% in 2012. The employment percentage was even higher among doctors under 40. About 33% of doctors worked directly for hospitals or in practices with some hospital ownership in 2016, a percentage that was unchanged from 2014. At Sanford Health, a 44-hospital system, administrators recruit about 100 physicians per year to ensure medical care remains viable in its most rural communities, some of which have only one physician or advanced practice provider, said JoAnn Kunkel, chief financial officer of the Sioux Falls, S.D.-based health system. Like Erlanger, Sanford said hiring more physicians last year improved the system's financial performance. That's because paying fill-in physicians is “incredibly expensive” and patients prefer the consistency of physicians who stay in their communities, she said. The physician-related expenses that health systems incur extend well beyond the direct cost of employment alone. Hospitals increasingly add administrative pay to physicians' salaries, for example if they also serve as medical directors, said Jeff Goldsmith, national adviser for the consulting firm Navigant. Hospitals also contract with independent physicians to cover their emergency departments and intensive-care units, as well as pay doctors for being on call. In some markets, hospitals pay doctors to serve as medical directors and to work on-call shifts in order to secure their loyalty and encourage them to direct patients back to the facility, Goldsmith said. In certain cases, he said physicians view hospitals “as a cash register,” and take advantage of such payments. “It's one of the most difficult issues in managing the hospital—finding the appropriate balance between what a hospital needs and what its physician community wants,” he said. Intermountain Healthcare, a 21-hospital system based in Salt Lake City that also is hiring docs, monitors its employed physicians' financial performance more holistically—with respect to the health system overall, including its health plan, said Clay Ashdown, the system's vice president of financial strategy, growth and development. In some parts of the South and Midwest, retiring physicians aren't being replaced, and if there are no doctors, there are no hospitals, Goldsmith said. In those situations, hiring or partnering with new doctors is not optional for health systems, he said. “Unless the hospitals subsidize the physicians to replace those older docs, the hospitals are toast,” he said. At Sanford, attracting people to some of the rural areas the system serves has been especially challenging, Kunkel said. “We have beautiful communities, but you're not going to be living in downtown Chicago,” she said. The MGMA's Hertz said a health system asked him more than 10 years ago for advice on how to strengthen its physician group. He recommended it put a physician on its board, a practice that—while commonplace today—was relatively rare at the time. Things have changed significantly since then. These days, Hertz has a simple but imperative recommendation for health systems to ensure successful physician employment: Replicate their private practice experience. In those settings, physicians have skin in the game; the success or failure of the practice matters to them. “In a lot of the unsuccessful employment models, the physician or physicians are brought on, they're left out of the decision-making process, they're left out of the opportunity to create their future,” Hertz said. 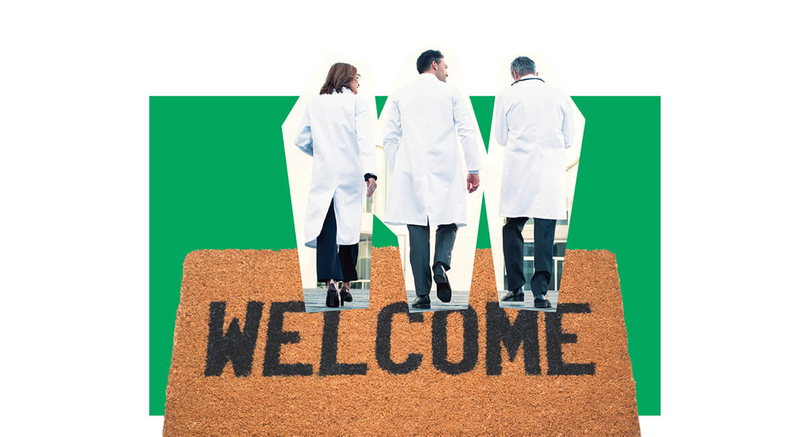 Under a successful model, systems give physicians governance and administrative duties and let them shape the organization's future, he said. At Vidant Health, which is cautiously dipping its toes into some risk-based payment models, it's especially important to involve physicians in payment reform, as they're the ones seeing the patients, Hepp said.